Meet SINOLIFT at MOVIMAT 2012 - News and Events - SINOLIFT MATERIAL HANDLING EQUIPMENT CORP. The main center in Latin America for generating business in the sector, MOVIMAT is the premier showcase of intra logistics, packaging, material handling and warehousing solutions in South America. The big event will bring together about 356 exhibitors from many countries around the world. 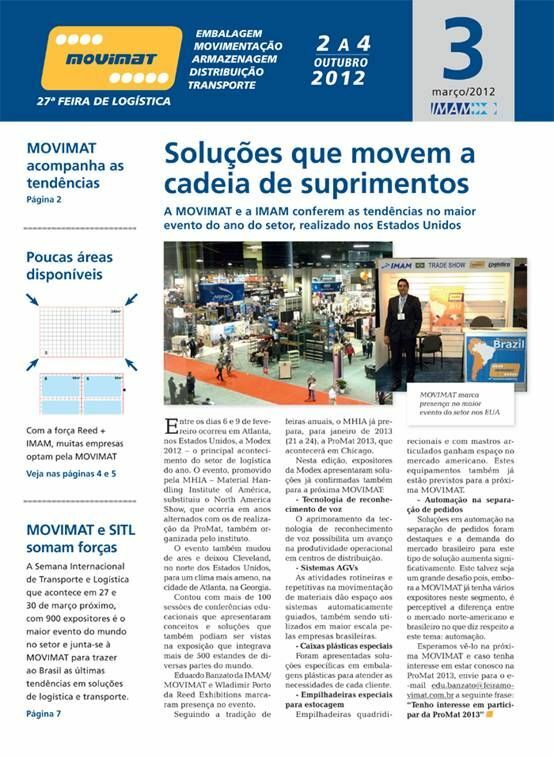 In view of its great attraction capacity, MOVIMAT is the best option and best chance for SINOLIFT to present to the Brazilian market. So SINOLIFT will be attending this most influenced exhibition in Brazil and even in the world. SINOLIFT kindly open our arms up to welcome customers, distributors, dealers from brazil, America and from other continents. the powerful appearing in MOVIMAT is a good choice for SINOLIFT to reinforce brand image and conquer new clients. To meet with SINOLIFT in MOVIMAT , that should be your best choice for material handling.